Street Views: 12 and 2 Suppl. On 15 February 1827, Benjamin Poulson gives evidence in an Old Bailey case where a young man is accused of stealing a pair of trousers from the shop of John Eddels. Poulson states that he is shopman in Eddels’ tailor’s shop in the Strand. 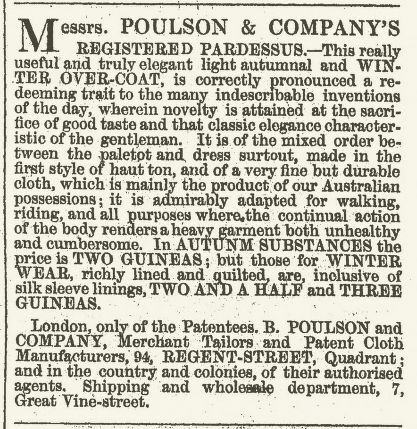 (1) From another Old Bailey case two years later we learn that Benjamin Poulson has his own tailor’s shop in the Quadrant, Regent Street. (2) Tallis’s Street View tells us that Poulson had his shop at 94 Regent Street and this is more or less confirmed by the 1841 census which sees Benjamin living with his sister Anna and a servant. The 1841 census records are not very informative, they just give the street (not the house number), the approximate age, the occupation and whether the person was born in the same county as the census was taken from. Benjamin is given the age of 36, his sister is 40 years old, Benjamin is a tailor and they live in the Quadrant, but were not born in the county, that is, not in Middlesex. So much for his personal life. I have not found any baptism records for either Benjamin or Anna, so cannot tell you much more about his family, other than that neither of them ever married. There is a bit more to tell about the shop, although not an awful lot. 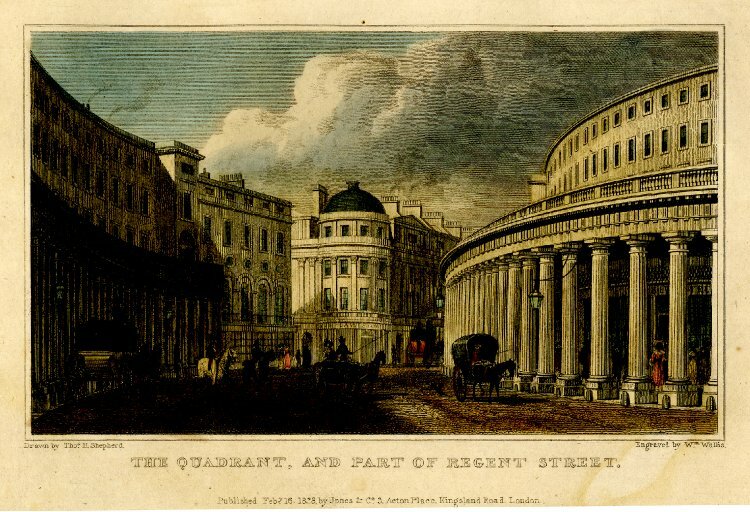 In 1846, Benjamin was one of the 47 signators of a petition to have the colonnade in front of their shops removed because of its “dilapidated state”. (4) Whether is was really as dilapidated as made out or whether the petition had more to do with the nuisance of the “ladies of the night from neighbouring Soho” using the space under the roof, or with the complaint that the roof of the colonnade blocked out too much of the light, making the shops dark and uninviting. (5) Whatever the reason, the petition was successful and the colonnade was removed. 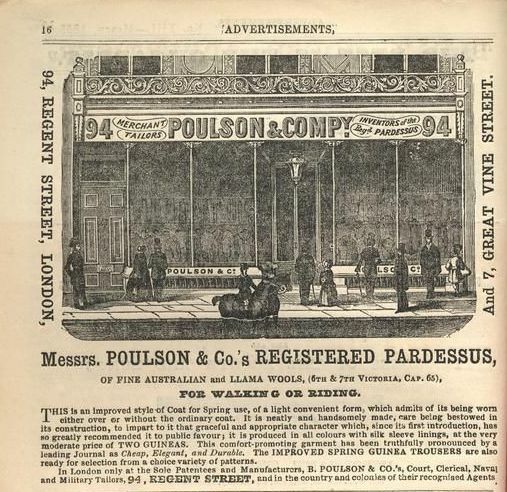 Some advertisements for Poulson’s shop speak of Poulson and Company, which probably implies the partnership with one William Worrell. When that partnership started is unclear, but it was dissolved on 27 September 1864. (6) Some advertisements also mention 7 Great Vine Street as another address for the firm, but by the time the partnership is dissolved, that address is no longer mentioned. There is not all that much more to be told about Benjamin Poulson, but one snippet of information in a will led to another will which revealed close family links between several shopkeepers that figure in the Tallis Street Views. On 27 October, 1827, Benjamin Poulson is one of the witnesses of the will of John Eddels, his master. Poulson’s address is given as 2 Coventry Street, so he had not yet started up on his own, but was still working for Eddels. John Eddels mentions two properties in his will, one at 64 Cheapside and the one at 2 Coventry Street. The other witness was James Eddels of 34 Piccadilly. 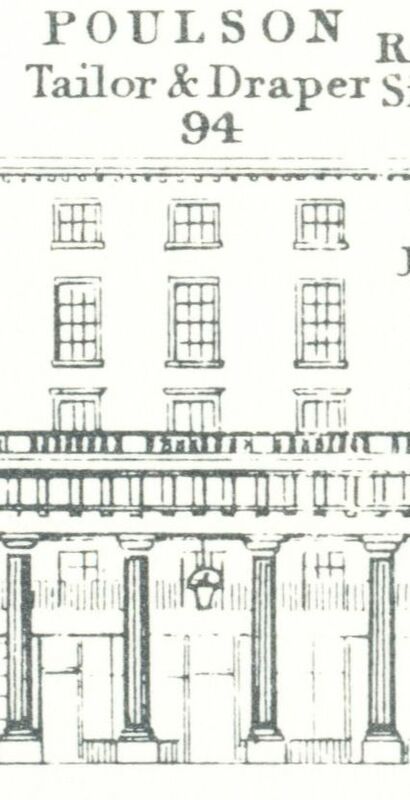 John Eddels died the following year and his widow Mary continued the business at Cheapside. John had intended the Coventry Street property to be disposed off and the proceeds to be invested for his daughter, but it seems that James Eddels took over the shop, or at least, he is mentioned there in the Tallis Street View of ten years later. John’s brother, Nathaniel Keen Eddels is, with John’s wife Mary, named executor and guardian of daughter Mary. Fast forward to June 1848 when Nathaniel Keen Eddels of 153 Whitechapel Road draws up his will. It is quite a complicated one and, besides providing for his wife Sarah, consists of a long list of bequests to various Eddels, Hemming and Wakefield nephews, nieces and cousins. Nathaniel (and John) had a sister Judith who married Samuel Hemming sr. Two of Judith and Samuel’s sons, Benjamin Hemming of Blackfriars Road and Samuel Hemming jr. of Piccadilly are among the relations receiving annuities from their uncle Nathaniel and are also listed in the Tallis Street Views. Nephew Samuel Hemming, friend Benjamin Poulson and the widow Sarah (nee Wakefield) are named as executors in the will, but the probate records hold a statement by Sarah that “for divers good causes and considerations” she is “desirous of renouncing … all my right title and interest in and to the probate and execution of the said will”. She obviously did not want the bother of the administration – no wonder as Nathaniel did not make it an easy and straightforward affair – and Benjamin Poulson and nephew Samuel Hemming are pronouced joint executors. But that was not the end of the story. Sarah Eddels died in 1858 and named Benjamin Poulson and a Wakefield nephew as her executors. (7) In 1864, in the Court of Chancery, the case Freudemacher v Poulson was heard. I have not seen the actual documents, but the entry in the National Archives catalogue suggests that the settlement of Sarah’s estate was contested on behalf of Eliza Sarah Freudemacher who was the daughter of Thomas Freudemacher and Eliza Wakefield. (8) According to Nathaniel’s will, Eliza was to have the rent of 153 Whitechapel Road after the death of Sarah and after Eliza’s death, her child or children were to receive the bequest. If Eliza died without issue, the property was to revert to the residual estate. It sounds as if Freudemacher wanted to make sure his daughter got her fair share. Whatever the outcome of the case, Nathaniel’s will gives us a good idea of the relations between the various families. The Eddels, the Wakefields, the Hemmings and indeed Benjamin Poulson all came from the Nailsworth area in Gloucestershire and most of them seem to have had a link with one or other of the non-conformist groups in the area. (9) The Hemming children were baptised at the Independent Forest Green Chapel in Nailsworth and although I have not found Poulson’s baptismal record, he was buried at Kensal Green which, although no proof as they also had an Anglican section, may indicate a Dissenter affiliation. Although Nathaniel himself was working in the furniture trade, the families mentioned in his will were employed in the cloth trade; many of the ones mentioned in the will were hosiers and we already know from the Old Bailey reports that John Eddels was a hosier/glover/tailor. 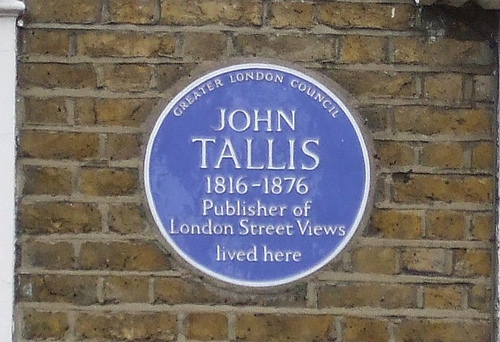 In Tallis’ Street Views we find hosier James (Creed) Eddels at 2 Coventry Street and 34 Piccadilly, Mary Eddels (John’s widow and/or daughter) at 64 Cheapside, also as hosiers, Samuel Hemming of Piccadilly, a hosier and Benjamin Hemming of Blackfriars Road, linen draper. No Wakefields have made it into the Street Views, nor have I found a family link between Poulson and the other families, but that may very well be through lack of sources. Who knows what can be found in a Gloucestershire archive. (1) Old Bailey case t18270215-104. (2) Old Bailey case t18290910-302. (3) England & Wales, National Probate Calendar (Index of Wills and Administrations), 1876. The executor is Henry Cook, a nephew. Value of the estate is £30,000, later resworn at £35,000. (4) “Copy of the circular letter addressed by the commissioners of Her Majesty’s Woods, Forests, and Land Revenues, to the lessees of houses in the Quadrant, Regent-Street, respecting the removal of the colonnade ; and of the replies respectively received to the said letter” in Parliamentary Papers, House of Commons and Command, volume 60 (1848). (5) See Ian’s blog for more information. (6) The London Gazette, 7 October 1864. (7) England & Wales, National Probate Calendar (Index of Wills and Administrations), 1858. (8) Court of Chancery, National Archives C16/197/E40. (9) A.P. Baggs, A.R.J. Jurica and W.J. Sheils, “Nailsworth: Nonconformity”, in A History of the County of Gloucester, Volume 11, Bisley and Longtree Hundreds, ed. N M Herbert and R B Pugh (London, 1976), pp. 216-217 (online here).